For centuries, two races have evolved hidden deeply within human culture - the aristocratic, sophisticated Vampires, and the brutal, feral Lycans (werewolves). To humanity, their existence is no more than a whisper of a myth. But to each other, they are lifelong mortal rivals, sworn to wage a secret war until only one race is left standing. In the midst of this ongoing struggle, a Vampire warrior, Selene (Kate Beckinsale), discovers a Lycan plot to kidnap a young human doctor. After shadowing Michael (Scott Speedman) through the city, she forms an unprecedented bond with him, and when the Lycans make their next move, Selene is there to fend off their vicious assault. werewolves, who have been on the losing end of the struggle for centuries. Kate Beckinsale (Serendipity, Pearl Harbor) and Scott Speedman (Dark Blue, TV's Felicity) star in a sweeping tale of deadly action, ruthless intrigue and forbidden love, all set against the backdrop of an ancient feud between the two tribes in a timeless, Gothic metropolis. 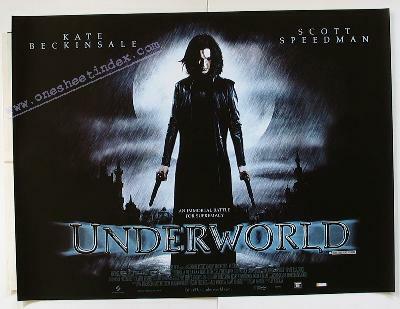 Screen Gems and Lakeshore Entertainment present Underworld, produced by Lakeshore Chairman Tom Rosenberg, President Gary Lucchesi and Head of Production Richard Wright. One night while riding the subway, medical student Michael Corvin is caught in a fierce firefight between the two mysterious "gangs." He catches the eye of a striking and sophisticated woman, the Vampire warrior Selene. Kate Beckinsale, who has garnered acclaim for diverse performances in films like Laurel Canyon, Serendipity and Pearl Harbor, takes on the intensely physical role of Selene, the sophisticated Vampire who is a top ranking member of the Death Dealers, an elite Vampire warrior class charged with hunting the Lycans into extinction. Selene's ferocity, says Beckinsale, is personal. "She's very much grounded as a character in the war," she says. "Her whole motivation is very emotional and involves having lost her whole family to the Lycans. In her job, she is committing constant revenge for that."